Wedding planning is a difficult task; between the dress, the photographer, the caterer, and the weather, it’s hard to plan the perfect day. There will always be things that happen that are completely out of your control. BEST-VIP offers car services for your wedding day to ensure no matter what the situation, your transportation will be at your convenience. From our minicoaches to limousines, our top of the line fleet will be able to help make your wedding day the most special day of your life. Over the past 20 years, BEST-VIP has helped make planning transportation simple. We have perfected the process of coordinating transportation and logistics and will work with wedding planners to understand both the needs and challenges of your event. All of our luxury minicoahes include a television system with interior monitors, DVD player, iPod connector, intercom system, and extra-large panoramic tinted windows. Not only will your wedding party have some privacy, but you will also be able to pick the music to help celebrate the day you want. Our minicoaches seat 15-35 people. All of our limousines include television systems with multiple interior monitors, DVD player, custom sound systems with CD – AM/FM, custom fiber optic lighting, multiple ice wells (stocked with sodas & waters), passenger managed climate control, bar stocked with whiskey, vodka and rum, custom “limo tint” windows, crystal rock glasses & champagne flutes, and privacy divider. Our limousines seat 6-8 people. From the moment you arrive to your sendoff, let BEST-VIP help make your wedding day perfect. Call or request a quote today! John Wayne Airport has anticipated being busier than normal for this 4th of July holiday. They are advising travelers to give themselves extra time for parking and to make it through airport security from June 28 through July 7. Passengers are reminded to leave all prohibited items at home, including fireworks. Traveling during the holidays can be extra stressful. Make sure to choose Best Chauffeured for your transportation to and from John Wayne Airport, and other airports in the Southern California area. Best will take care of all the details so you can relax this 4th of July. Have you ever seen a stretch Ferrari? How about a stretch semi truck? These 10 extreme limos push what’s conventional and appeal to people who like things that are way out of the ordinary. Some of these wild limousine conversions take the hottest cars and stretch them out, while others simply pack a party onto wheels. Special Offer From Best Chauffeured! 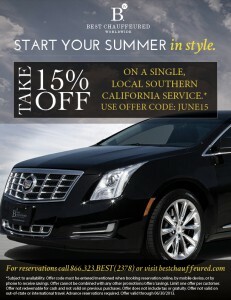 To help kick off the summer right, Best Chauffeured would like to extend a special offer to all of our customers. 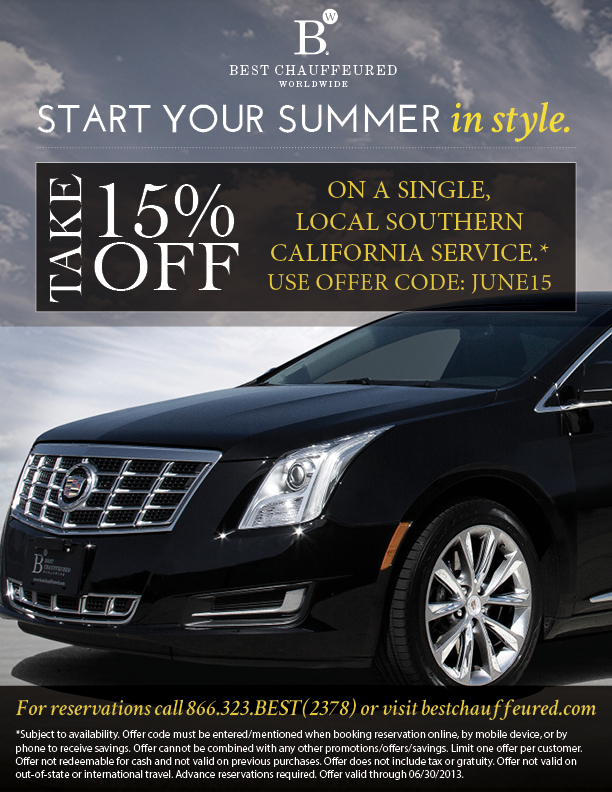 Take 15% off on a single, local Southern California service during the month of June. Use offer code JUNE15. See details below!